I like broccoli and cauliflower as much as the next person, but sometimes I just want some more variety in my dinner vegetables, especially since starchy vegetables are off the menu for the nonce. This craving for variety brought me to Napa cabbage. Normally, I would just use it for stir-fry and other asian-inspired dishes, but I tried roasting it a while back and was really pleased with the results. If you’ve never roasted vegetables before, now is the time to start! The high heat does some wonderful things to vegetables that must be tasted to be believed. Heat the oil in a pan on medium heat. When it’s hot, add the garlic, and gently cook for about 5 minutes. Be careful not to burn the garlic. Take it off the heat, and set it aside to cool. Place aluminum foil on two baking pans. One piece is enough, as it’s just to help with clean up. To cut up the cabbage, cut the head in half, remove the core, and then slice widely at the leafy green portion and thinly at the white celery-like side. Don’t be alarmed because it looks like you’re cooking enough cabbage for a family reunion. It will lose 2/3 of its volume in cooking. Toss the sliced cabbage in the oil and garlic, coating everything evenly. Spread the cabbage over both trays, trying to keep everything in a single layer. 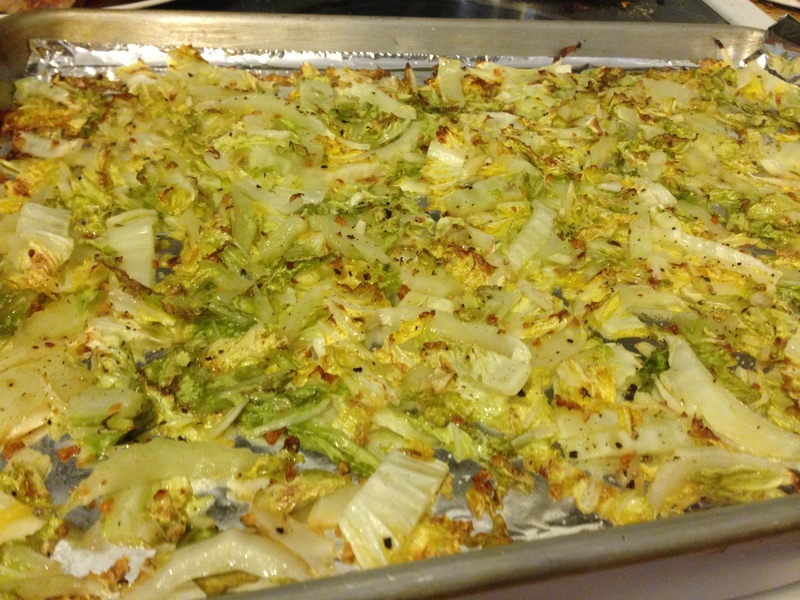 If you overload the trays, the cabbage will steam instead of roast, and that is not nearly as good. Season with salt and pepper. It will likely take more salt than you think to taste seasoned, but you can always add more later. Roast for 15 minutes. When it’s done, parts of the cabbage will be browned, caramelized, and delicious. 12 cups of raw cabbage will result in 4 cups of cooked. It cools quickly, so serve right away with whatever you like. If you’re making this for just 2-3 people, halve the recipe. I can attest to this receipe. She made if for me once or twice. I could eat the whole thing by myself!